The Greek colonization of the Black Sea is associated with two mythological events: the War of Troy aimed at unblocking the passage to the straits (Dardanelles/Bosporus) which was controlled by that city and the expedition of the Argonauts led by Jason to conquer the Golden Fleece in Colchis (today's Georgia); in origin this second myth was referring to the western expansion of the Greeks into the Adriatic Sea up to the mouth of the River Po. Euxeinos Pontos, the Greek name for the Black Sea meant Hospitable Sea, but it most likely replaced Pontos Axeinos (Inhospitable Sea), a reference to the dangers of that sea; an aspect which struck the Greeks unfavourably was the absence of islands while the presence of many islands facilitated their navigation in the Aegean Sea (for this reason they built a temple to Mars on the only (very small) island they found). 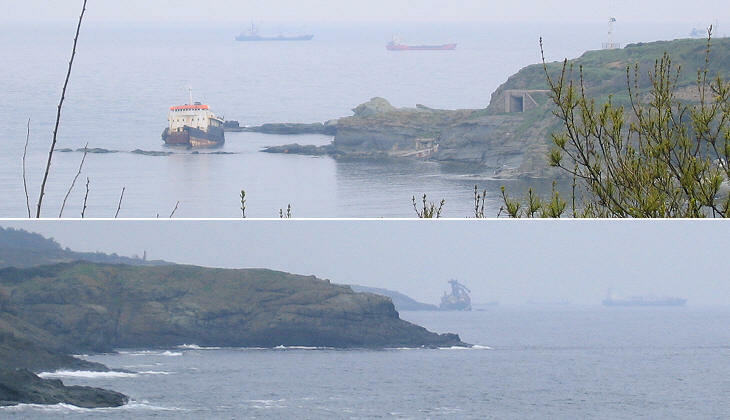 In particular the transit through the Bosporus posed great risks; in the Argonauts' myth these are symbolized by the Symplegades, moving rocks which perpetually shrouded in the sea mist guarded its northern entrance. Genoese ships had to wait for favourable sea and weather conditions before approaching the Bosporus; for this reason a small bay which is located a few miles west of the entrance was fortified with a small castle; similar to other Genoese bases it was occupied by the Ottomans after they conquered Costantinople in 1453. 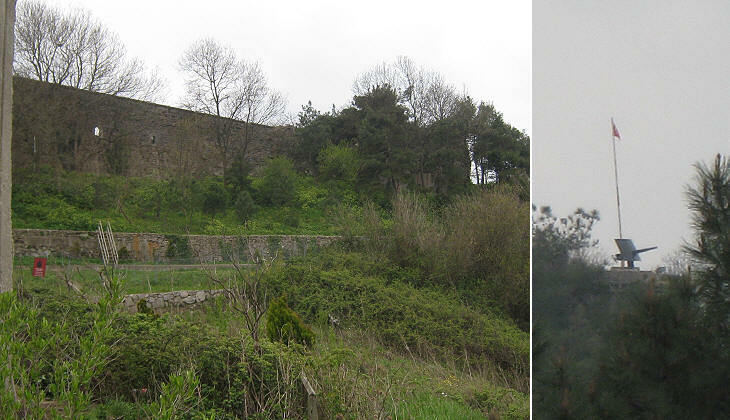 It is hard to understand why the Turkish Army still considers the castle a military zone, photographing of which is prohibited; maybe just because it is the best sightseeing place of a nice beach resort in the proximity of Istanbul and high ranking officials use the modern apartments built inside the compound (this comment applies also to the outer fortress of Eski Foca). Kilia, the Greek name of the site, means sand and a very long beach is located to the west of the fortress; Kilia was also the name of an important Genoese base at the mouth of the Danube. Perhaps the myth of the Symplegades originated from two rocks which guard the point at which the Bosporus opens up into the Black Sea; the site is named after a lighthouse built by the French during the Crimean War. Rumeli means European/western in line with the traditional meaning of Rum (Rome) in the Levant. 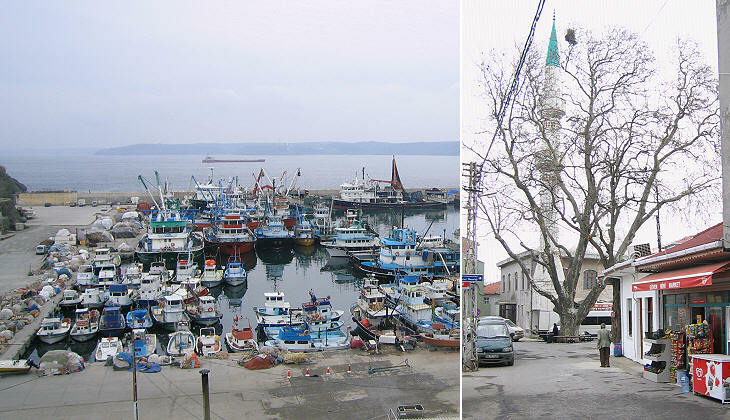 Rumeli Feneri was a Greek village until the exchanges of populations between Greece and Turkey in the 1920s; today it is badly modernized, but it retains the high plane (sycamore) tree under the shade of which the elderly used to spend their days. 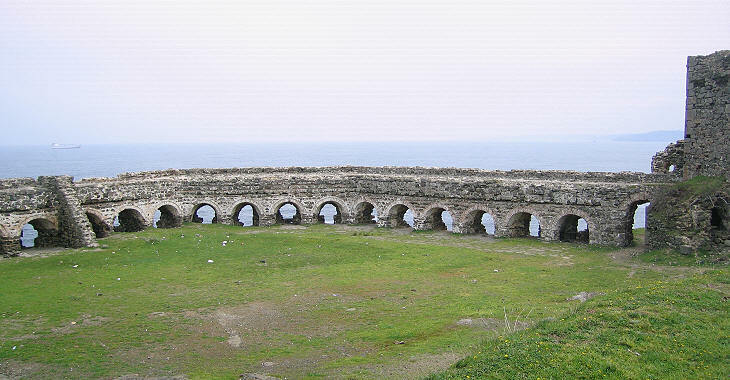 Tourist guides covering the Black Sea coast tend to describe in excess "Genoese castles". A comment, in similar vein, by Mark Twain - The Innocents Abroad: In this connection I wish to say one word about Michelangelo Buonarroti. I used to worship the mighty genius of Michelangelo - that man who was great in poetry, painting, sculpture, architecture - great in everything he undertook. But I do not want Michelangelo for breakfast - for luncheon - for dinner - for tea - for supper - for between meals. 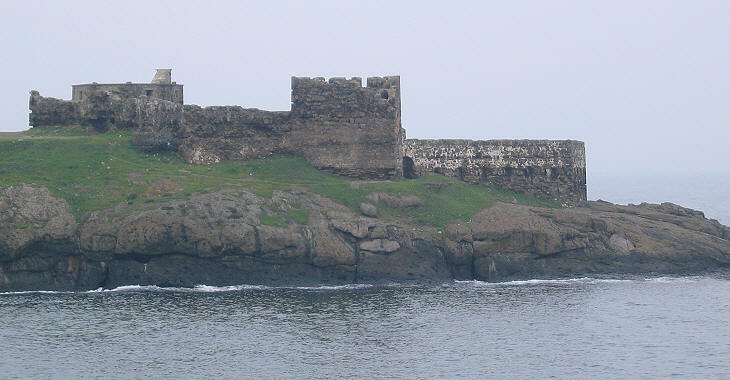 In the case of Rumeli Feneri the original medieval fortification was totally redesigned to place many cannon there. Because for many centuries the Black Sea was an Ottoman lake, the change must have occurred in the late XVIIIth century or even later.